If every band labelled Black Doom were half as talented as the guys in Stoic Dissention, there’d be no reason left for complaining. Coming out of nowhere, both figuratively and literally, Stoic Dissention, a Colorado-based band, have probably delivered one of the most promising 'debut' releases in the Extreme Doom sphere to date. Labeled Black Doom, it was with the utmost circumspection that I received this for the purpose of reviewing it. When most people claim they play Black Doom, they end up serving us tasteless bits of what we now call (and dread) Dark Metal, which for most bands of this obedience means no more than boring repetitive riffing played in the course of an hour and fifteen minutes. I was damn wrong. If every band under the Black Doom genre were half as talented as the guys in Stoic Dissention, there’d be no room left for complaining. Consisting of four tracks and the usual old couple intro/outro, Senium delivers the goods, the riches and the utmost pleasure of listening to a full- blown project with real musicians sharing the same view on a real project. 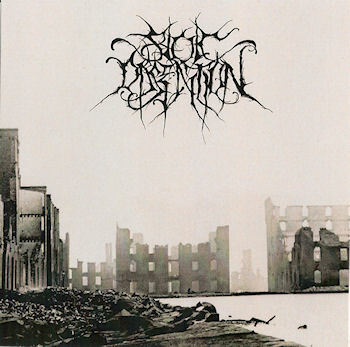 More than Black Doom, you might think of Stoic Dissention as some kind of Extreme Doom project. Sure the Black Metal vocals are predominant and they even 'grace' us with a few typical Scandinavian brutal onslaughts which Darkthrone wouldn't be ashamed of, but overall the musicality is rather more Doom Death than any other genre. Try picturing the majesty of Ahab’s debut, the perfect desolate sonic landscapes of Asunder’s Works Will Come Undone with the utmost raw despair of Obskure Torture. Think also that they share quite many similarities in the songwriting with Mournful Congregation’s The Monad of Creation. If I’d read that from someone else and didn’t know the music to start with, I would probably end up thinking the guy's paying some lip service or turning into a useless fanboy, but it’s not the case. To temperate these 'excesses', I probably should say that when the band goes more upbeat and tries to blast their way through more orthodox Black Metal, those drums sound quite cheap, but it happens only twice during the whole EP and is soon subjugated by the tragic beauty of the rest. At no point during Senium, one can feel boredom or repetitiveness. It’s so varied coming from such a 'younger' band (well, they did hone their skills in a few other bands, not necessarily Doom bands, by the way) it’s almost a bit scary. In a good way. These guys have not only mastered the essentials of Extreme Doom in one shot, but also showed that their very first release may rival with the best out there; the future may certainly hold bright promises for them and we ought to keep them under our radar when the time comes for their debut album to be released.